A translated account and analysis of the actions of 3rd Panzer Group in Operation Barbarossa, written by the officer commanding, Hermann Hoth. Hermann Hoth led Germany's 3rd Panzer Group in Army Group Center—in tandem with Guderian's 2nd Group—during the invasion of the Soviet Union in 1941. Together those two daring panzer commanders achieved a series of astounding victories, encircling entire Russian armies at Minsk, Smolensk, and Vyazma, all the way up to the very gates of Moscow. In this work, originally published in German in 1956, Hoth discusses his exact command decisions during Barbarossa—still the largest continental offensive ever undertaken—to reveal new insights into how Germany could, and in his view should, have succeeded in the campaign. Hoth analyses the origin, development, and objective of the plan, and presents the situations confronted, the decisions taken, and the mistakes made by the army's leadership, as the new form of mobile warfare startled not only the Soviets but the German leadership itself, which failed to provide support infrastructure for their panzer arm's breakthroughs. Hoth concludes his study with several lessons for the future offensive use of armored formations. His firsthand analysis is vital reading for every student of World War II. A useful study on how the German leadership failed to provide adequate logistical support to capitalise on the breakthroughs made by the Panzer divisions. 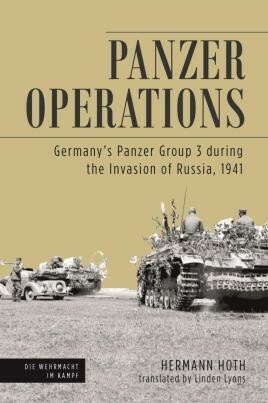 The appendices include actual operational orders, but (unlike Guderian's book Panzer Leader) this is not a memoir - it is a masterclass in what happened and how to command armour. For that reason alone it should be bought and read by anyone who thinks they know about tanks, command or staff work as well as those with an interest in military history. 5 stars. It is interesting in seeing how a senior commander viewed the machinations of higher command and the impact on campaign performance. Hoth produced a more balanced view of the fighting that some of his contemporaries. The standard line taken by many German generals was that Hitler's decisions were almost always wrong, and if he had only left the direction of the war to them, then the result would have been different. Hoth, at least in the mid 1950s when this book was written, was more willing to admit that sometimes Hitler had a valid point, and some of his orders produced significant German victories.